When it comes to the issue of safety in the home, household water systems can sometimes present a bit of a catch 22 situation. In order to kill legionella and other bacteria, hot water must be heated to a temperature of 60 degrees or above before use. However, such a high temperature brings a different danger in the form of scald injuries. Although well known to any plumber worth his salt, there is still a prevailing lack of awareness amongst consumers of the importance of Thermostatic Mixing Valves (TMVs) in preventing dangerous scalds from baths, taps and showers so we've dedicated this week's blog post to giving you all the information you need about these potentially lifesaving devices. Every year, almost 600 people in the UK suffer the effects of severe scalding injuries and 3/4 of these victims are under three years old. As well as children, the disabled and the elderly are groups deemed to be particularly at risk of scalding and therefore even more able to benefit from the installation of TMV in their homes. Not only is recovering from scalding an extremely painful process, treating a scald also costs an estimated £250,000 across a person's lifetime. 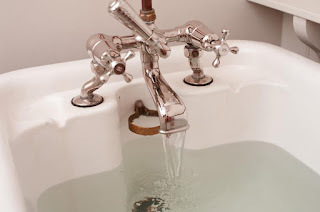 Since 2010, it has been mandatory for plumbers to install thermostatic mixing valves (TMVs) in household baths in England and Wales, however, this only applies to new build homes. TMVs help to prevent against scalding injuries by blending hot and cold water to ensure that water comes out of the tap at a safe temperature - for bath water this is normally a maximum temperature of 46 degrees). Most TMVs also have a failsafe mechanism so that in the event that the cold water supply fails, the valve will close off, protecting the user from any scalding water and alerting them to a problem. If possible, ask for the TMV to be incorporated directly into the tap fitting as mixing at the outlet helps to prevent against the risk of legionella. For complete peace of mind, it really is worth getting a TMV installed in your home. The risk is particularly high where whole body immersion occurs, such as in baths and showers, so TMVs should normally be fitted at these outlets. However, if you live with particularly vulnerable individuals such as the very young, very elderly or those with significant disabilities or sensory impairment, the devices should be fitted on hand washbasins and sinks too. Competent plumbing installers will be able to fit these for you, as well as answering any questions you may have. It's also important not to take an "install and forget" approach to TMVs! Quality Plumbers will be able to undertake necessary maintenance to ensure your device continues to keep your family safe from the devastating effects of scalding over time. To find a Quality Installer in your local area today, search by postcode at http://www.aphc.co.uk/find_an_installer.asp.